Taste: Chocolate plus strawberry is perfection, not to mention totally romantic! 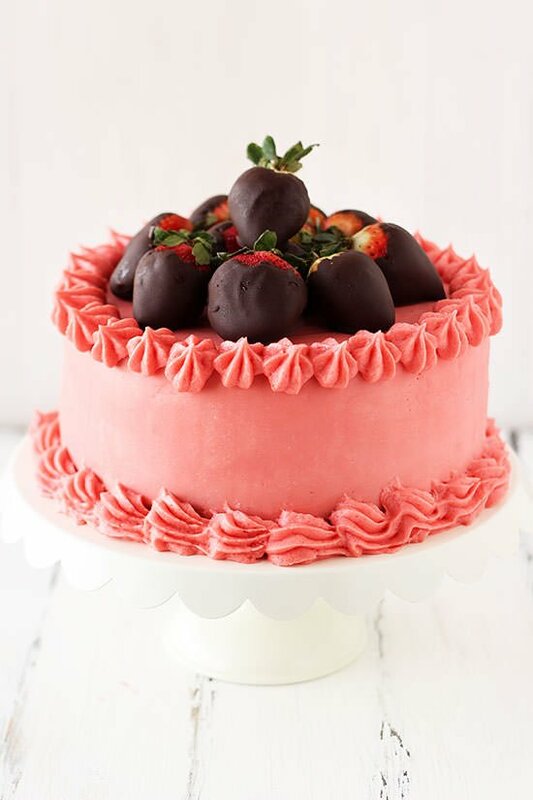 Texture: The cake is ridiculously rich and moist, the frosting is luscious and flavorful, and the chocolate covered strawberries on top add a whole new realm of juiciness combined with shattering chocolate goodness. MMM. Ease: Assembling and decorating a beautiful cake is totally doable, especially with my step-by-step video, but it does require some patience and makes a mess. Let’s be honest! Totally worth it when you see jaws drop at its beauty! Appearance: Stunning and so impressive. Pros: Romantic and beautiful cake that actually tastes good. Would I make this again? Absolutely. Would be great for any romantic occasion. I am so giddy sharing this Valentine’s Day Cake recipe and easy cake decorating video with you that it was almost impossible to wait until now to publish. 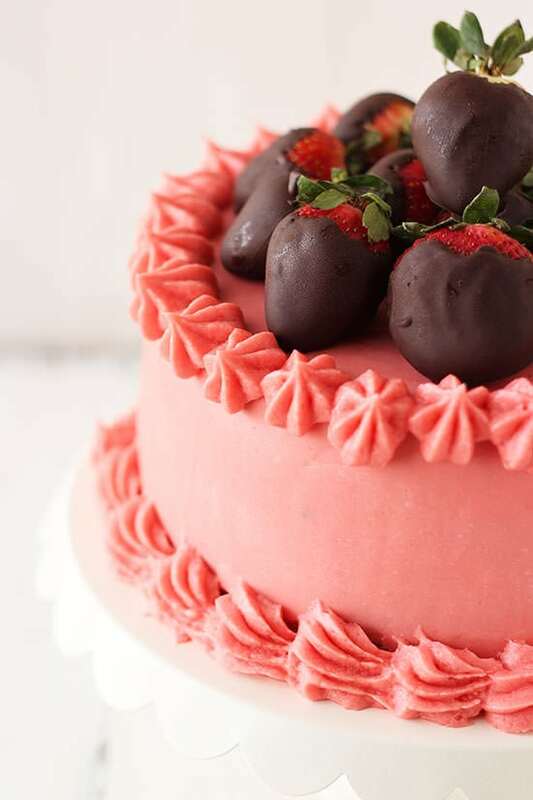 This cake turned out so beautiful it would be the perfect way to show your love and appreciation for someone this Valentine’s Day, or any other special occasion. The best part is that if I can do it, you totally can because I have little patience for cake decorating (Cake Boss gives me nightmares). I’ve included a step-by-step video showing you exactly how to replicate the cake you see in these photos, including a bunch of tips and tricks so be sure to give that a peek below. The chocolate cake is so unbelievably moist, rich, and flavorful, even people who don’t like cake will like this. 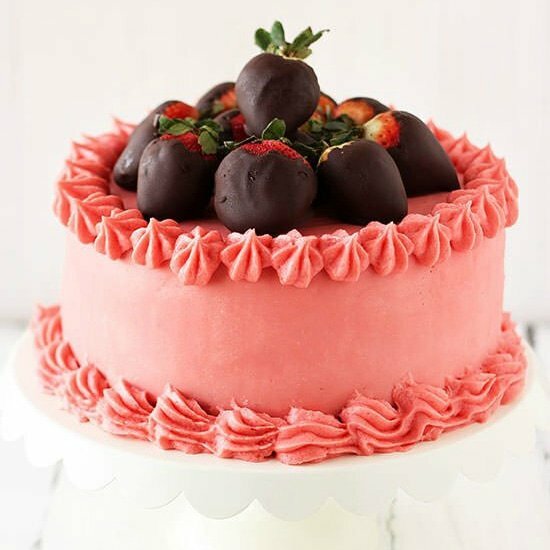 Not to mention the strawberry buttercream adds that perfect luscious, creamy, and thick bite of flavor that complements the chocolate wonderfully. And c’mon. Chocolate covered strawberries on top? Does life get better than that? I don’t think so! By the way – if you want some extra tips on buttercream, check out my post on How to Make the Best Buttercream! The cake is purely heaven! 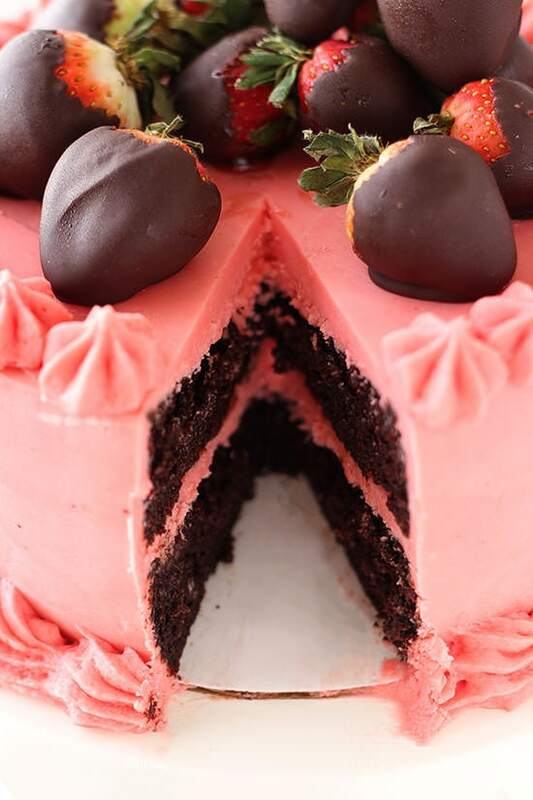 I love the chocolate cake with strawberry buttercream. It’s perfect for Valentine’s Day! Beautiful job! It sounds delicious, I love the chocolate covered strawberries on top. wow, this looks amazing!! it’s gorgeous! Stunningly gorgeous! This cake is a Valentine’s Day showstopper!!! I’m at a loss for words! This cake truly is a work of art! Oh WOWEEEE this is simply beautiful!! I love everything about it!! Wow! That cake is beyond beyond beyond beautiful!!!!!! Your cake looks amazing! I have never made a homemade cake so what do I do with the buttermilk? Do I just add the powder buttermilk? Or do I mix the buttermilk powder with water and then add it to the recipe? I’m not sure what “buttermilk, shaken” means? Just regular liquid buttermilk. When it sits in the container for a while it tends to settle and needs to be physically shaken to make cohesive again. Your cake looks awesome. Will definitely try it out. YOur cake is awesome. Will definitely try it out. Do you freeze all your cakes before frosting, if so how long do you frost them for are they covered , uncovered, and with what ? Yep! Did you watch the video?! You could put it in the fridge but it will take longer to firm up for frosting. Can this be made into cupcakes? If so, how long do you bake them for? I just made this cake. Not only is it fun to make, it is beautiful and delicious! I see me making it other times during the year! My family went wild over it! They were saying it was the best cake I have baked while they were eating it!! This is now my one and only chocolate cake recipe! I made it exactly as your recipe read. I did put strawberry preserves between the cake layers instead of the buttercream icing to reduce the sweetness that icing brings, but I do this on all two layer cakes! Ps – be sure to let the cake cool before turning the layers onto the cooling rack or they will crack. This cake is soooooo moist! Many thanks Tessa! Wow! Lovely Valentine’s Day Cake, we just added this cake to our menu, people love this chocolate and strawberry cake. If you do not add the coco powder will it be a vanilla cake and still taste good or do you have to add the coco powder?